Stir-fried rice noodles -- these days they're so common worldwide that we've all (I would wager most of us, anyway) ingested them at one point or another, some place or another. Frankly, what's the big deal? 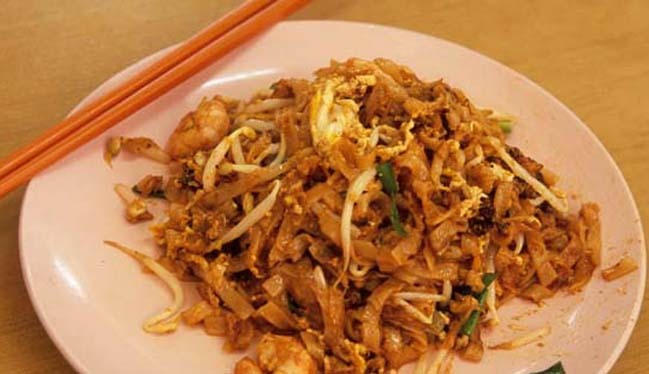 What we have above is a plate of char kway teow, a treat that, along with laksa and nasi lemak, might well be considered Malaysia's national dish. A tasty -- but inevitably greasy -- pile of noodles, the residue of which probably lingers in your stomach a wee bit too long after you've pushed back from the table, right? No, not this plate; not this noodle. 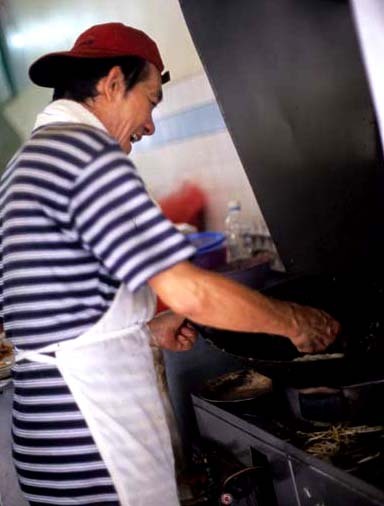 It takes a certain bit of artistry to fry up a serving of supple noodles lightly kissed with, but not drowned in, grease. This is the big deal: this is a plate of stir-fried noodles that is, for lack of a better word -- fluffy. Can stir-fried rice noodles be "fluffy"? Should they be? This man banks his business on it, and it's quite a steady business indeed, so I guess the answer to that rhetorical question would be: Yes, "fluffy" is a most sought-after characteristic of char kway teow, at least in this little corner of the world. Wang works out of a small coffee shop (only 3 food stalls) facing a parking lot, behind a row of stores (including an Austrian restaurant ... ??? I don't know, maybe it's just me, but in Malaysia's wet heat Austrian fare somehow just does not strike a chord) about 15-20 minutes from downtown KL. 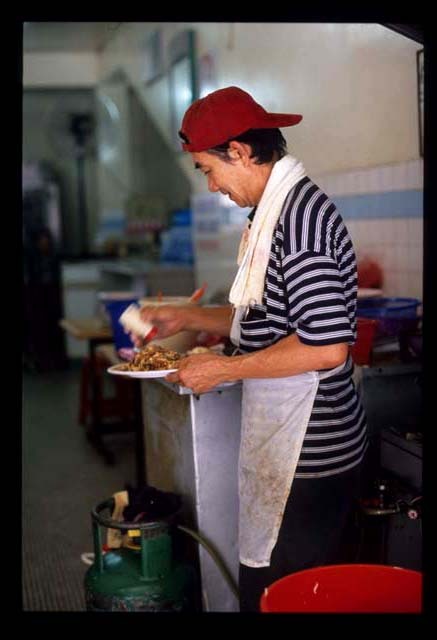 Friends introduced me to his kway teow shortly after I arrived in Malaysia, at lunchtime on a weekday. The coffee shop was packed out and at least one customer at every table (and quite often the entire table) was waiting for a plate of Wang's workmanship. The backlog was about 40 minutes. When Dave and I revisited on a recent Saturday the shop was noticeably quieter -- but the wait for char kway teow was still a good half hour. Luckily the coffee shop's wonton mee (wonton and thin egg noodles in soup)vendor is not nearly as busy, so we were able to occupy ourselves with a perfectly tasty bowl of shuijiao (boiled pork dumplings in soup). 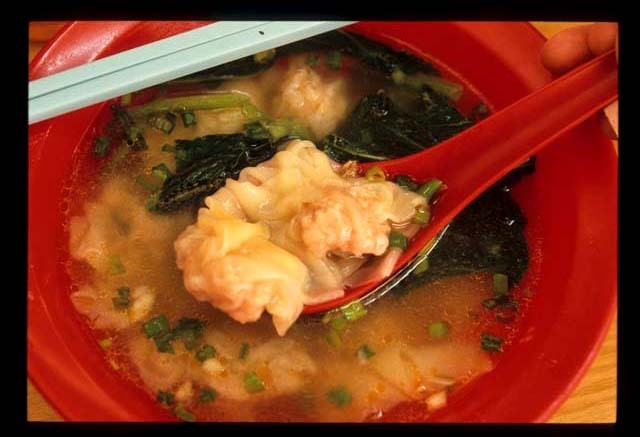 Eight dumplings of thin dough encasing well-seasoned pork, not overcooked, in a rich broth with plenty of greens. Very tasty, but really not the main event at this coffee shop. Back to the topic at hand. 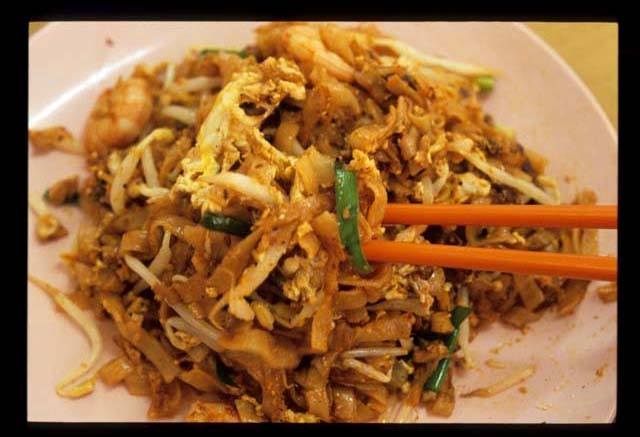 What's the secret to a fluffy char gway teow? Observing Wang at work gives a few hints. Number one: wok master must truly enjoy his work. 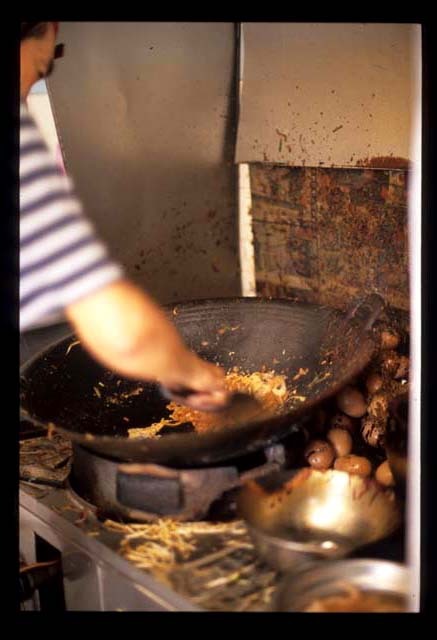 Here, Wang starts a plate of noodles by stir-frying an egg and then removing it from the pan. Number three: once rice noodles are added to the mix, ingredients must be kept moving at warp speed, nonstop. From this point on until they are plated, Wang pushes, stirs, flips, turns, cuts, and churns the delicate noodles, while at the same time gently pressing them to the wok to achieve the lightest bit of smokiness. To finish, he reintroduces the cooked egg and adds a fresh one, creating layers of egg flavor and texture: overdone and just done, firm and tender. A shake of white pepper finishes the dish. The result -- a plate of brilliantly fried rice noodles tangled with big, unevenly chopped chunks of garlic, bean sprouts, scallions, eggs, prawns cooked so they retain a bit of "crisp"ness, and cockles tender and tasting of saltwater. A spoonful of chili sauce added during the cooking process, together with the end flourish of white pepper, add a low-level hit of heat. As for the noodles, they're airy not leaden; light not heavy; barely veiled rather than soaked in grease. In a word, fluffy. Our plates, once cleaned (1 minute 30 seconds tops), show dabs -- not slicks -- of oil. This, more than anything, tells me that Wang is a master of his art. Char guaytiaow and shuijiao at Restoran Seng Lee, behind row of shops at 6-1 Jalan Batai (including Klimt's Austrian restaurant and Hock Lee minimarket), Damansara Heights. Mornings to mid-afternoon. Great choice! I've been eating at this stall for a couple of decades at least. 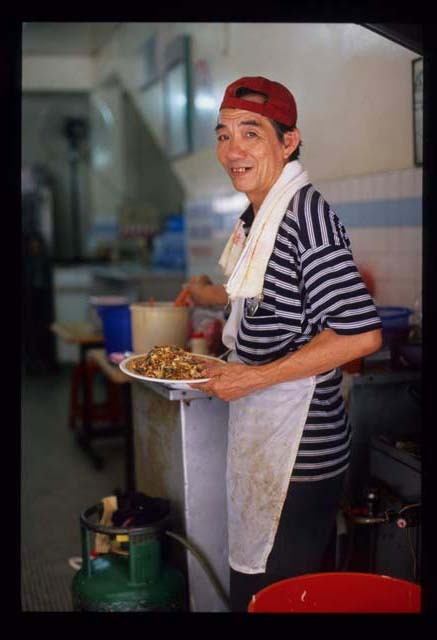 If you go at non-peak times, the guy will fry your koay teow to your exact specs (more bean sprouts, more chives - and only the stems etc etc), or at least he humours my "When Harry Met Sally"-type requests. Another side dish you could order is from the pork noodle stall. I normally order just the soup with everything in it, but without the noodles. Goes v well with the koay teow. Yeah, I thought that this was the place SW said you'd been eating at since you were a kid (same guy behind the wok the whole time?). Many bemoan the horrific changes in KL's landscape over the years, but I sure couldn't find as many decades-old eateries in major US cities as exist in KL. That's the inherent beauty of the hawker stall. Long may they live! I saw him adding a fried egg on top of sb's order when we were there. Q: you can get a "small", "big" or "special" --- any idea what the "special" is? Yums! This is my fav place for CKT. I like going non-peak time too as he fries it so much better when he is not rushed. I think a special means extra prawns/cockles. Actually I don't even know what a big or a small is - I just walk in and tell him I want my usual! And yeah, it's the same guy behind the wok all these years. BTW, if we can get a sizable group together, the chap will even come over and fry it at my home. (He says no minimum order for me, but I guess I should still make it worth his while!) May be a good idea for a New Year party? Hi...it's been very entertaining, and visually satisfying to read your Eating Asia. the char kuey teow and pulut panggang definitely brought me memories of home. there are malaysian restaurants where i live but unfortunately, the taste cannot be duplicated. i guess i'll just have to appease myself with your blog. We are big fans of this CKT man too. Been eating his version for decades, preferring his over the more lauded Tengkat Tung Shin version. Umami, can you expound on the "lauded Tengkat Tung Shin" version? Where is it, and why is it lauded? Hi Robyn, it is much-lauded in the sense that many people think the Tengkat Tung Shin (TTS) version is the best in KL. People like my sister, my sister-in-law, my father, even a roving hawker critic like KF Seetoh of Makansutra. I bumped into Seetoh when he was filming the KL edition around the same time that I took the picture of Wang, and Seetoh was saying to me, in hushed tones, that he thinks the TTS version is better. I don't have a copy of the KL Makansutra guide, it probably gives them a higher rating than our friend Wang. I think the TTS version is too wet and too black and I prefer the drier, paler Penang style. Anyway, the stall is along Tengkat Tung Shin, in an old corner hawker centre. No address on hand, but maybe you can look at image 7 of my post below- I took the picture when I was waiting for my noodles. Image 9 is of the noodles. Think Edward will be more than pleased to show you the Tengkat Tong Shin version - he always raves about it - I prefer this Jalan Batai one. Have never really been a fan of fried noodle/fried rice dishes. But you certainly make this one sound tempting. Would it be fair to call them a "dry fried noodle" - Is that a term? As you say there is no glossy greasey business in there at all. One other thing. My only experience of Malay food is on Penang and, while good, I wasn't as blown away as I was expecting. I understand penang food is a bit different - very curry/Indianesque heavy - apart from the hawker stands. The KL stuff is quite a different chap altogether. No? Well, I've nothing against fried noodles in general, I do love Thai fried noodles in particular and phad thai done well streetside in Bangkok is nothing like a version you'd have anywhere else, IMO. But this CKT was quite nice. See comment above by umami indicating other versions are indeed "wetter" and "blacker" (from dark soy, presumably). Of course I will feel it my duty to undertake further investigation. 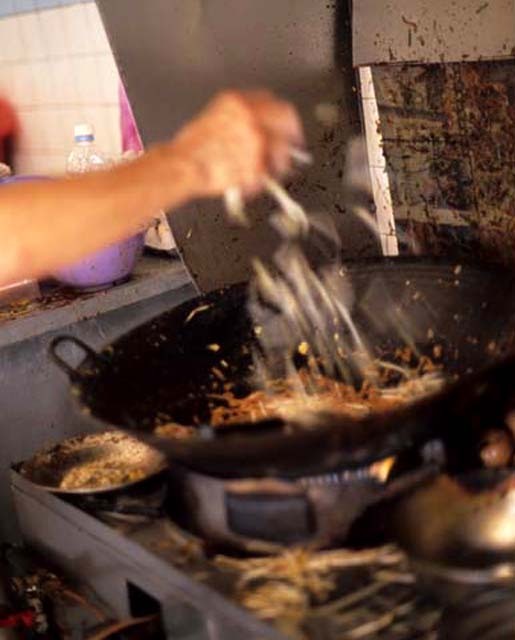 My understanding is that -- in addition to southern Chinese influences -- Melaka is more firmly Indian-influenced when it comes to cuisine (old trade routes and all) whereas Penang food evinces some Thai touches (many of the original southern Chinese settlers came by way of Phuket). I hear you and to be honest I think it was half our fault. we arrived in KL and thought OK we've got a week where shall we go. And we just jumped on the next flight to Penang. It was Chinese new year and A LOT of places were closed, so our assessment probably isn't totally fair. We certianly enjoyed exploring all that was on offer, although Penang itself was dullsville. Satay House is really pretty good but having eaten at the source now for a while ... not as good as what's here. But that's always the case, isn't it? Nonetheless, I'm betting you'd enjoy the fish curry, kangkung fried with sambal, fish head curry (you gotta check ahead to see if they've got it), and mee siam. Most of all though, you just have to get over there for Sat lunch -- curry mee (laksa) -- the chef puts his heart into it. Lots of Malaysian expats there. I will have to agree with maukitten that the char koay teow in the Lorong 100 Tahun coffeshop in SS2 is better than the Jalan Batai one, even when fried without lard, which I would normally do by special request. The version is dryer. I have not returned to Tingkat Tongshin for sometime. So would not be able to vouch for the standard. I used to find the standard there a bit inconsistent, depending on who was at the wok (there's the father, the mother & the son).